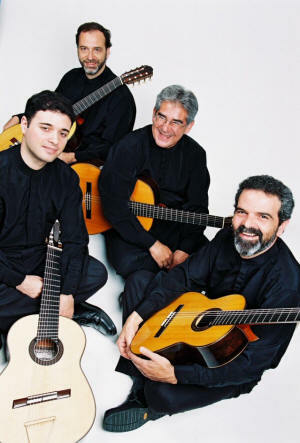 Oct. 5, 2005--From a country famous for its guitarists, the Brazilian Guitar Quartet will perform at 7:30 p.m. Tuesday, Oct. 25, at Arkansas State University in Jonesboro in Riceland Hall of Fowler Center, 201 Olympic Drive. The event is a Riceland Distinguished Performance Series. Hailed by the Washington Post for its seductive sounds and virtuosic gusto, the Brazilian Guitar Quartet has performed from coast to coast with rave reviews and to sold-out halls. The quartet is quickly becoming one of the world’s most sought-after guitar ensembles, being known as the “dream team” from Brazil. Among the group’s prestigious recent and upcoming engagements are the Hong Kong International Festival, Wolf Trap, the Coleman Chamber Music Series at Caltech, Spivey Hall in Atlanta, Shriver Hall at Johns Hopkins University in Baltimore, the Florida International Festival, as well as international festivals in Guatemala, Puerto Rico and throughout Europe. The Brazilian Guitar Quartet was the headliner at the inaugural World Guitar Congress in Baltimore last year. Along with the Baltimore Symphony, the group gave the world premiere of a specifically commissioned concerto by Brazil’s 2001 Composer of the Year, Ronaldo Miranda. The groups debut CD “Essencia do Brasil” has been showered with praise not only in the United States and Brazil but also in France, England and Japan. Each of its three CD’s have made the “Best of the Year” lists. The Brazilian Guitar Quartet made its first American tour in 2000, and it has returned every year since to growing acclaim. The guitarists’ sparkling and varied programs feature masterpieces from Brazil and others. Performance tickets may be purchased by calling 870-972-2781 or 1-888-278-3267, or online at http://tickets.astate.edu. Prices are $30 and $20 for adults; $23 and $15 for ASU faculty and staff, senior adults, and K-12 students; with a special ASU student rate of $10 and $6.